This Chinese company will have to find another way to increase suit sales. For a brief moment, this Iron Man moulded plastic suit glimmered in the void like a tiny unlicensed star; then Marvel stepped in, and crushed its crowdfunder. The Iron Man Factory had turned to Kickstarter to fund what would have been a very sweet piece of kit, judging on looks alone, but without permission from the folks in New York - who, let's not forget, are wholly owned by Disney, a company that takes its copyrights seriously - it was never going to happen. The suit started as a project to build an Iron Man helmet. 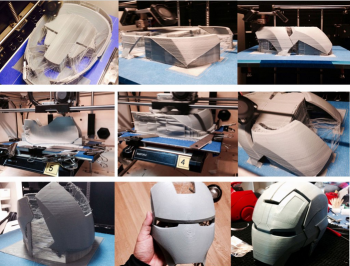 The engineers, based in Shenzen, China, began making the helmets with 3D printing technology, and decided that the best way to capitalize on their project was to increase volume of sales, thus reducing cost. That meant more stuff had to be made, and the team was working on a full injection moulded suit ($1,999), the helmet on its own, ($1,800), or the whole thing from head to toe, ($35,000). A space-grade aluminium version of the suit was also in the works. Now Marvel's stepped in, the suits will be unavailable for sale outside China. If you've been hoarding Bitcoins, now might be the time to use them - or maybe not; things change so quickly. Note: Tech Crunch is the source of the $35,000 figure, but I can't help thinking that might be out of whack, since that figure is well beyond the stated cost of the suit and helmet combined. I suspect an extra 0 was added, and the true price might have been $3,500. It's all academic now, since it's not for sale.